With help from the Benjamin Josephson Fund, I spent the month of August 2010 living and working on a small ship which houses a floating hospital that provides medical care to the people of Bangladesh's northern char region. Chars are small, flat, silt islands that are subject to constant change as rivers and heavy rains erode their delicate structure. People who live in this geographically unique area have very limited access to medical care given the changing landscape and their resulting migratory patterns. Every day patients face unrelenting heat as they traverse the vast Brahmaputra River by boat, walk through jute fields and wade through rice paddies to reach the ship's mobile clinic run by Friendship NGO. 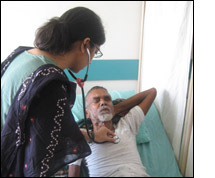 There they can receive medical attention from doctors and paramedics equipped to provide primary care. The ship also hosts visiting surgeons and specialists who regularly take care of patients referred for further intervention. During my time working on the boat, I was able to see patients with a variety of illnesses familiar to primary care in the US, but in a completely different context with numerous constraints that we rarely must consider in our own healthcare system. Adult and pediatric patients presented frequently with upper respiratory infections, asthma exacerbations, rashes, diarrhea, manifestations of nutritional deficiencies. We also saw patients with minor traumas requiring laceration repair or referral for reduction of fractures. In addition to commonplace ailments, I saw a number of tropical diseases, rare even for the region. One young man presented with troubling swelling in his groin and lower extremities for a number of months. The textbook image of filariasis came to life in front of me as he raised his pant legs. Without support from the BJF I would not have had the privilege to work in such a unique setting or contribute to the care of this underserved population. This opportunity has given me an invaluable glimpse into the challenges of global health, the amazing work being done by NGOs, and the possibilities for further contribution.